TC19 - Ticket Dispenser - Q-net International Ltd. 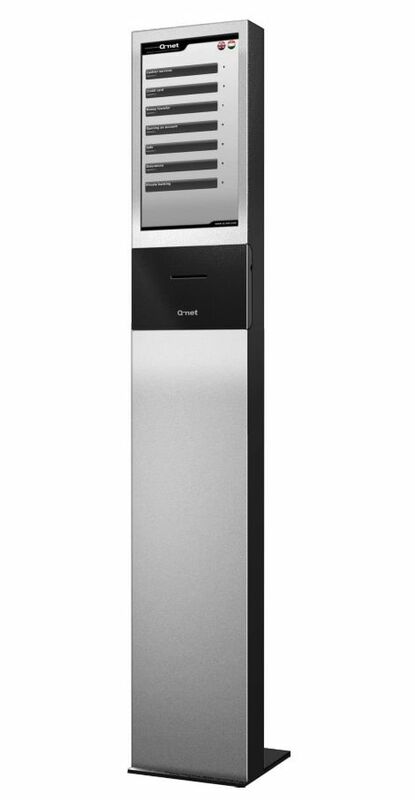 The “Classic” ticket dispenser is one of the high-end Q-net products for this purpose. The Hungarian Industrial Design Awarded unit is a decorative part of any modern customer area. The “portrait-oriented” 19-inch LCD enables to display up to 10 service (group) buttons in one page, plus 5 language buttons to choose from. Pressing a service group button will show the next menu level with up to ten buttons, which can be used for services or further service groups. With the help of this unique menu structure TC19 is capable to display unlimited number of services. The high speed 2 inch thermal printer is connected to an internal PC on which a Windows operating system is running. Having a flexible designer group and manufacturing capacity, we are able to fulfil extreme requirements concerning any special shape, coloration or hardware elements. In this way the special design can represent and reflect the image of the company or its business philosophy.